Brown’s® created our Bird Lover’s Blend® for the experienced hobbyist and novice alike. We drew on the experience of six generations of the Brown’s® family to develop this product, which is designed to attract backyard wildlife in all regions. Brown’s® created our Bird Lover’s Blend® for the experienced hobbyist and novice alike. We drew on the experience of six generations of the Brown’s® family to develop this product, which is designed to attract backyard wildlife in all regions. We know it will bring the beauty of nature into your backyard habitat and make the wildlife feeding experience fun and rewarding for the whole family. 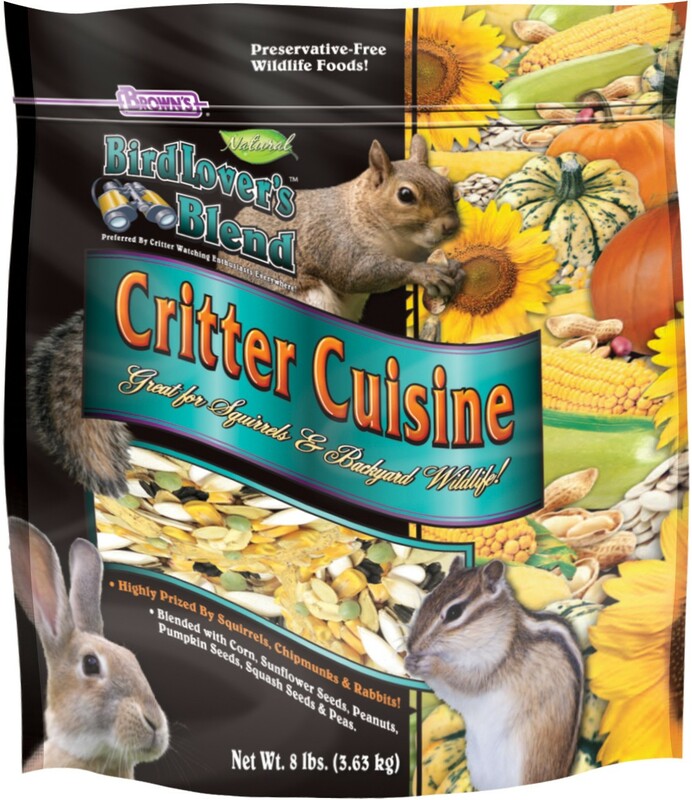 Bringing Nature to Your Backyard: Critter Cuisine is blended with gourmet ingredients to attract the greatest variety of wildlife—squirrels in particular. By providing squirrels and other wildlife with their own food source, you will help encourage them to stay away from your wild bird feeders. 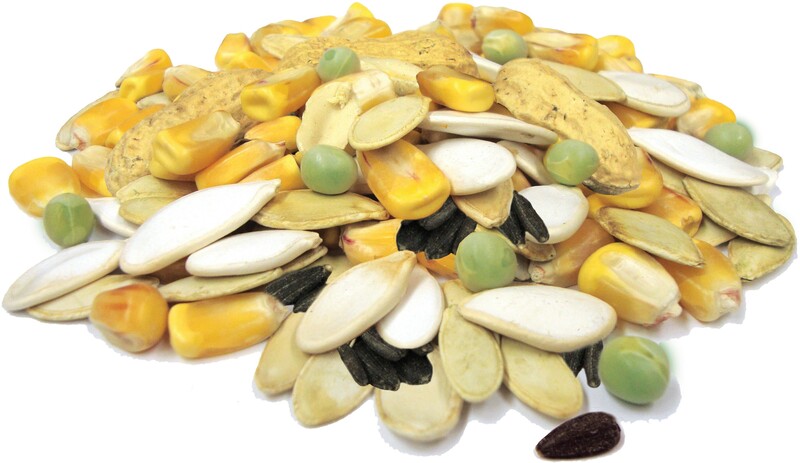 Bird Lover’s Blend® includes lots of the foods they love: whole-kernel corn, black oil sunflower seeds, in-shell peanuts, snow-white pumpkin seeds, squash seeds, and whole green peas. 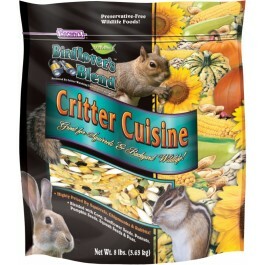 We believe this blend will make both your wildlife and bird feeding experiences more enjoyable. Why Feed the Squirrels? Sometimes intruding wildlife can be a frustrating part of backyard bird feeding, but when you establish methods to deal with them, you may find they can be as enjoyable as the wild birds. Their energy, not to mention their sometimes crazy antics, will give you and your family a daily dose of fun and excitement. Most wildlife doesn’t hibernate, therefore feeding can be a year-round activity. Wildlife Feeders: Feeding trays or boxes with drain holes are best, but you can also sprinkle Critter Cuisine directly onto the ground. • Position the feeder at least 10 feet away from squirrels’ jumping-off points and a minimum of 6 feet above the ground and out of reach of deer. • For Hanging Feeders: Use 3-4 feet of monofilament fishing line to hang the feeder. It is almost invisible to squirrels. • For Hanging and Pole Feeders: Install baffles above and below the wild bird feeder. 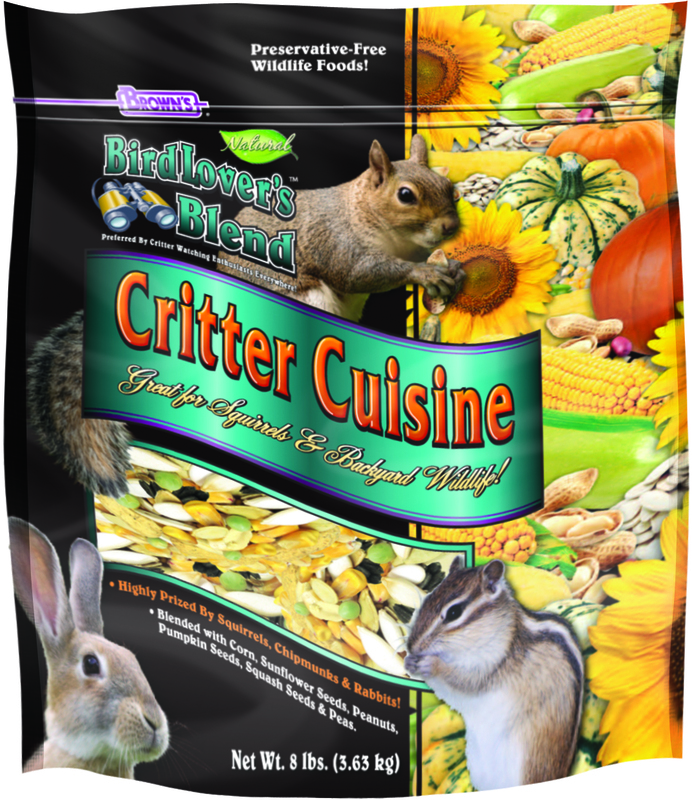 • Establish several wildlife feeding stations away from bird feeders and keep them filled with Bird Lover’s Blend® Critter Cuisine. • Feeder Location is Critical: Position the wildlife feeding station away from the bird feeders but within your viewing area. A Full Harvest of Delectable Goodies! We blended Critter Cuisine with fancy, white pumpkin seeds, squash seeds, whole green peas, in-shell peanuts, black oil sunflower seeds, and whole-kernel corn. • Highly Prized by Squirrels, Chipmunks and Rabbits! • Preferred By Critter-Watching Enthusiasts Everywhere! Whole Kernel Corn, Green Whole Peas, Squash Seed, Whole Peanuts and Snow White Pumpkin Seeds.